He has created the music in nearly all our LD games . I am every time amazed how he can creates a great atmosphere with his music. Thank you for playing and voting. If you like to play a game over Xmas designed for young children. Please try out our Pixies Flowers. Unfortunately could not finish the game. I used crocotile3D to build the 3D model. Rage the Stage was our 3 game and the first as a team of 3 people. We accepted the challenge “why not try something new“. So no Java and no Libgdx. A bigger challenge for sammakko as for me. For our 3th game we used Godot Engine. I’ve had some training with the MiniLD #58 – MuMoPo. Our only preparation was thinking during the theme voting about what game we can make with the themes. Unfortunately, for An Unconventional Weapon we haven’t any cool idea! dark3zz (soundcloud.com/dark3zz) has joined us for the first time with his amazing equipment. For us, he was big source of inspiration and pushed us forwards. – only on the last day we had a working game to play and improve the gameplay. Picture are from the post jam release. The Game wanted to be “Metal”. So I’ve decided to use Spectrasonics Omnisphere which i had on my Macbook in our Dev Apartment. Ive startet from scratch, did first a few Loops for the Game, went over and created some Intro, Credits and Backtracks. The Drums are from Ableton Live. One of the Drumloops, viewed as a Midi Clip. RAGE THE STAGE – Almost Done! We are finishing and polishing the Game. Here’s the Teaser Image. 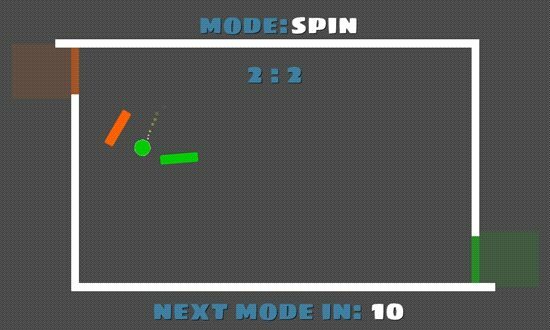 My first mini Ludum Dare entry and also the first game with this great and unique game engine (Godot Engine). It’s a two player game, so take someone beside you and have fun! Thank’s to my sons for help me out testing the game. We have had a lot of fun creating and inventing our 2nd Ludum Dare game. Many thanks to all the comments and inputs. You can try it out by yourself…. There are some bug with elevator (graphically) and some music loading. 40 queries executed in 0.154 seconds.